Apple and Starbucks have expanded their “Pick of the Week” program to offer free iBooks, the redemption codes for which will appear on cards just like the free app and free song offerings that currently exist in Starbucks stores. 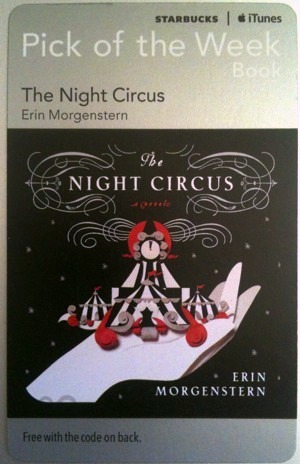 The first iBook offered through the program is “The Night Circus “, a popular novel about a magical circus that otherwise retails for $12.99 on the iBook store or $15 on Amazons Kindle. Technically this was announced yesterday by Starbucks, but I’ve visited different Starbucks stores yesterday and today and didn’t see the book cards offered yet, so the current availability seems to vary by location. The picture of the card on the right shows what you’re looking for, via MacRumors, and they should be sitting near the register and the place where you put sugar in your drinks. Don’t forget you can also buy coffee with an iPhone using their app too. These are at all the Seattle stores, I grabbed one yesterday for my wife. Apparently the “Pick of the Week Book” is not a complete book, but just a sample selection from the book. That’s not the same thing at all, and is bound to annoy the heck out of a lot of customers. Hey Starbucks, a “sample selection” is not a book. I picked one up from Dublin Airport. Unfortunately they are only valid in Ireland and they were available in the departure lounge. That is for people flying out of Ireland. No bloody use at all!